Reg $855.00. Save $100 right now!! The sale is for a limited time only while lamp is still available. Yes, Gorgeous, Special, Unique and Exotic! 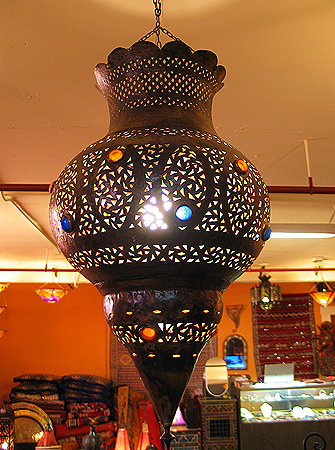 This chandelier is all 100% hand made in Morocco from copper and decorated with resin. It does have a beautiful antique look to it to a point where some of our customers who purchased them thought these lamps were antique!!. This chandelier is equipped with three chains that it hangs from. Yes, also call it a magic chandelier because when it is lit and the other lights are off, it does its trick and transforms the surrounding into another world of romance and throws intricate shadows on the walls. It will greatly add an exotic accent to your home. Remember to keep the spirits happy! As a bonus, we give you a wiring kit with the chandelier. Limited number in stock! Please keep in mind that we do adjust the shipping cost after we receive your order and then based on your zip code we adjust accordingly if needed and in most cases adjusted down.